Sleuths of the Excise and Taxation Department, Punjab, along with the Mohali police, seized diamond-studded gold jewellery items and cut and polished diamonds, worth Rs 4.16 crore, from two Mumbai-based passengers at the Chandigarh international airport here today. The passengers, identified as Neeraj Bakulesh Jhaveri and Rushang Ramesh Mehta, were travelling on the Mumbai-Chandigarh flight, which landed here this morning. Shalin Walia, Assistant Commissioner of State Tax, Mobile Wing, Chandigarh, said the suspects were intercepted on a tip-off. 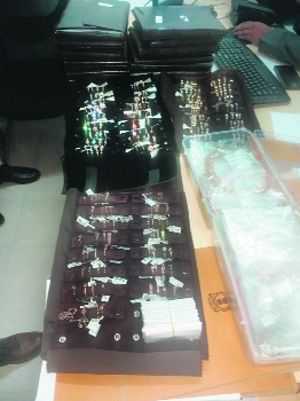 “They were carrying the jewellery items and diamonds without documents, required to enter the Punjab area,” said Walia. He said both persons belonged to Mumbai-based Rosy Blue (India) Private Limited. “They told us that they brought the jewellery items here to show these to a local jeweller, but failed to produce the required documents,” said the official. While the Excise Department has issued a notice under Section 129 of the SGST/CGST Act, the Mohali police have registered a DDR against the duo at the Airport police station. Inspector HS Bal, SHO of the Airport police station, confirmed that a DDR had been registered and further investigations were on. Walia said the department would impose a penalty and tax on the total value of the confiscated items. “There will be 3 per cent penalty and 3 per cent tax on the total value of the items. We will also summon the government-approved evaluator tomorrow to ascertain the exact value of the jewellery items,” said the official.